It has been hectic to say the least behind the scenes. I have several projects to share, but this week, I have been working on a family table re-finish. It has been extremely humid in my area, and it is taking forever and a day for the oil based paint to dry. Not to mention, I added a little too much stain, which made the table a nice dark color, but only added to the length of time it took for the piece to dry! In the meantime, I have been catching up in between projects, and an increasingly busy schedule on my WordPress reading. 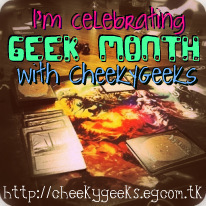 Last year, I was invited by Elise at Cheeky Geeks to take part in her blog’s annual Geek month. In the spirit of Throw Back Thursday, and for those who missed the original post you may want to check it out (especially if you are an “1980’s geek” like I am.) 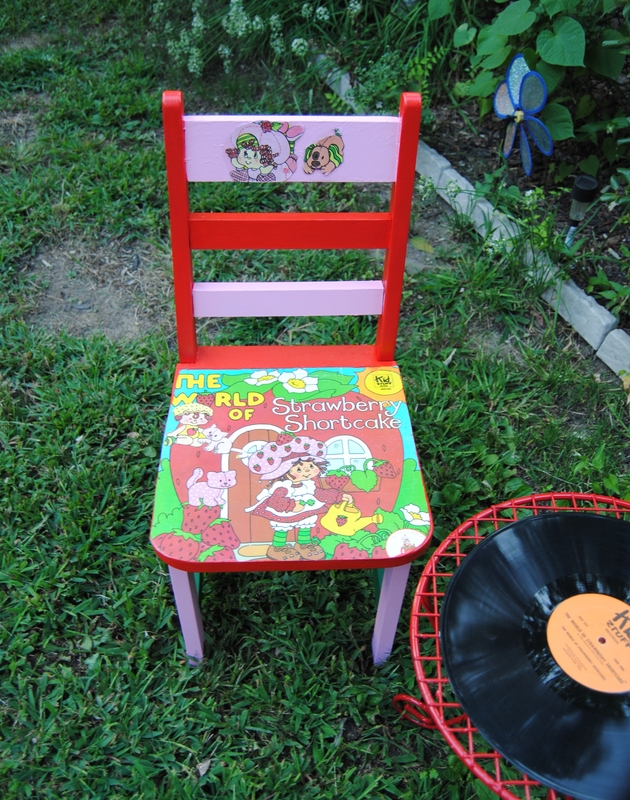 I upcycled an old kid’s chair using an old Strawberry Shortcake record. Be sure and stop by Elise’s blog for this year’s geek month. If you are anything like me and have a “Geeky” side you will enjoy following Elise on her Geek Month journey. Elise also had a challenge for me if I was willing to accept: Answer 50 questions about myself. It would seem that she is interested to know a bit more about the women behind the Upcycle. Seemed like a great time to accept this challenge, while I quite literally wait for the paint to dry…. What are you wearing?-Yoga pants and a rock tee. I am all about comfort! Ever been in love? Yes, and I love, love! Ever had a terrible breakup? I went through a divorce, what do you think? How much do you weigh? It’s never polite to ask a lady her weight! OTP (one true pair, favorite fictional couple)? Kristoff and Anna from Frozen. My daughter is into Disney at the moment! How old are you? 39 and holding on for dear life! Quality you look for in a partner? No question sense of humor! Favorite actor? Peter Dinklage I love, love him! Where do you go when you’re sad? Unfortunately, inside my head. How long does it take you to shower? 10 minutes I have to be quick I have a toddler! The reason I started blogging? I wanted to share my thriftiness with others, and I love to write! Meaning behind the name of your blog?It popped in my head one day. I kept thinking of the song “Little Suzi’s on the Up” by the band PhD. Last book you read? OMG embarrassing, All my reading is on the computer! Last time you were insulted? LOL probably every day, but most likely I don’t know about it! Favorite chat up line? I don’t have one! It’s whatever pops into my head at any given time. Last time you hung out with anyone? Last weekend. Who should answer these questions next? I wanna know more about Daniela Joe If she’s willing to give it a go! This weekend I decided to give “On The Upcycle” a much-needed reboot. I felt the old blog layout was getting a bit stale. Last night I experienced an evening of insomnia, and decided it was the perfect time to explore new ideas. I hope you all like the new look! Happy 4th of July weekend everyone! Happy New Year from On The Upcycle! 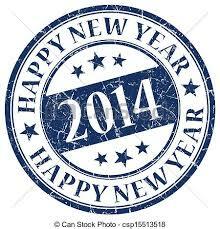 I want to take the opportunity to wish all of my readers a very safe and prosperous New Year! As with most years of my life 2013 has been filled with many good times and some “not so good” times. In April 2013, I began this humble little blog with zero expectations, and since then I have received over 25, 600 total page views, (and counting) and in December, 2013 On The Upcycle reached a milestone of over 200 followers. 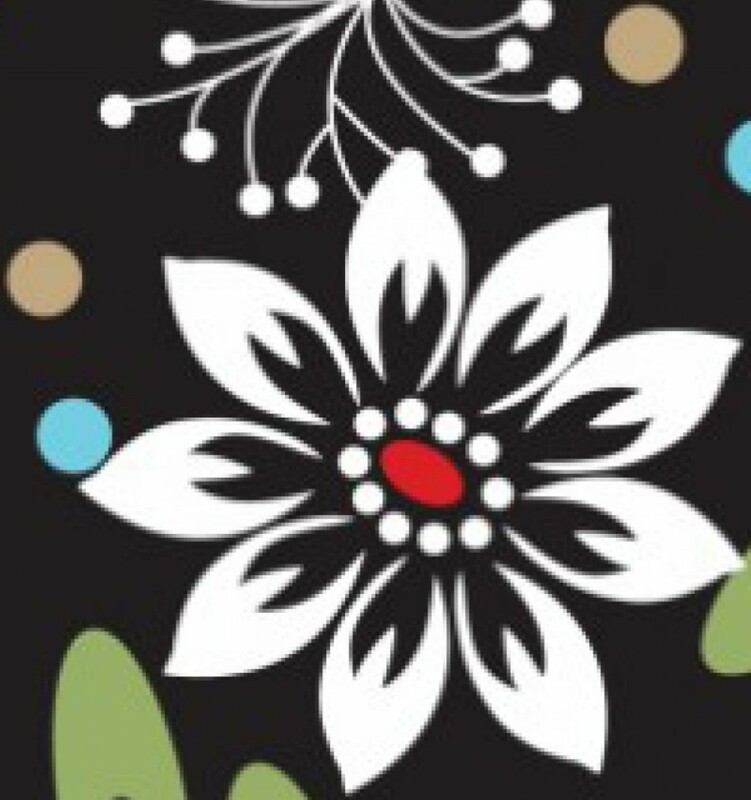 I had the opportunity of being featured in two digital craft books on Amazon, The Green Crafts Lifestyle, and The Green Crafts Lifestyle Christmas edition. I was also a guest blogger for the first time this year, contributing a project for Geek Week, On Elise’s Cheeky Geeks Blog. As crazy as it sounds, I was also contacted regarding a crafting reality show! Don’t expect to see yours truly on TV anytime soon, but it was all still very flattering. Also, a special thank you to those who became involved with the “Upcycle” and brought me items to restyle from attics, trash bins , yard sales and thrift shops. On the Upcycle was also very lucky this year and won two prize drawings. I would like to send out a BIG THANK YOU to Diana at Ray’s So Crafty Blog and Kathy and Deb over at Second Hand Roses for their generosity and appreciation of their readers by sponsoring these giveaways. I would also like to send ”Congratulations” to Daniella Joe’s Blog who won On The Upcycle’s very first prize giveaway. A very special “Thank you” to Katherine at Pillows Ala Mode, who welcomed me to the Word Press community by sharing my blog with her readers, and nominating On The Upcycle for the good neighbor award. I wish I could thank everyone who helped me along the way. Thanks to all my readers who took the time to comment and “like” my posts. Everyone here has kept me inspired even when I felt I did not have much to give. As with any New Year, 2014 is filled with mystery. I am hoping to continue the Upcycling mission in 2014, and be the best mother and wife I can. My resolution this year, is to treat myself better both physically and emotionally. This will be my greatest challenge. As with many of you out there, it is easiest to neglect yourself, when making sure everyone else’s needs are met. This will be my goal for 2014 and beyond. Let’s hope I can make it happen! May all your wishes and dreams come true in 2014! 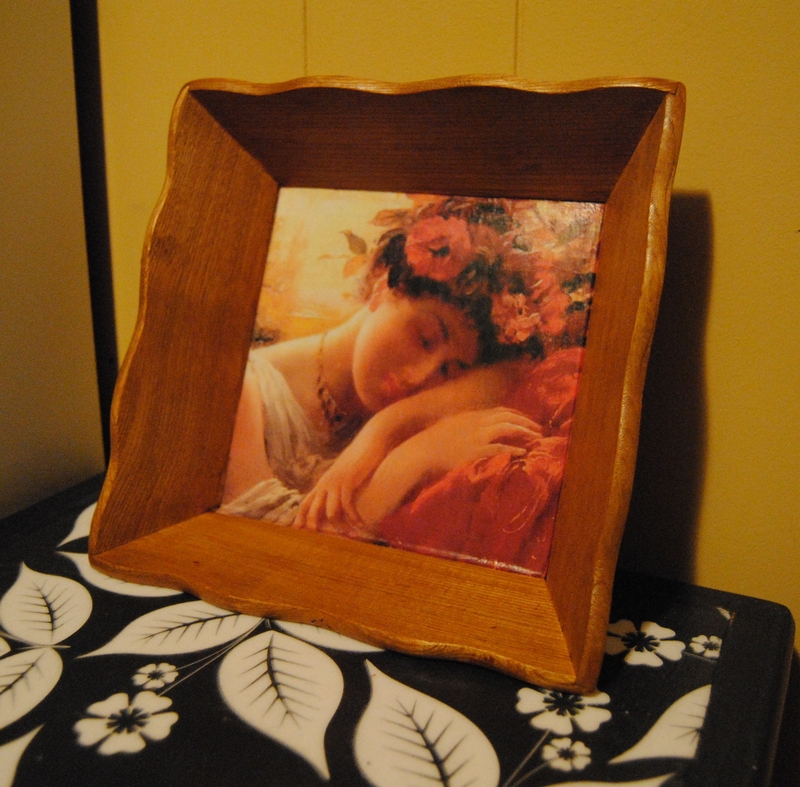 I am “Thankful” For My Readers: Decoupage Wooden Tray Giveaway: WINNER! 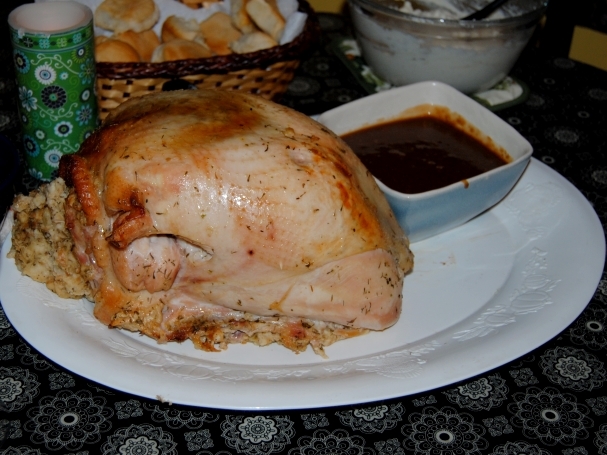 I hope everyone had a very Happy Thanksgiving day with their family and friends. Patricia from DanielaJoe’s blog Congratulations! Please e-mail me your full name and address to ontheupcycle@gmail.com and I will ship your prize out to you! Please be sure and stop by these amazing blogs. You will be very “thankful” that you did! I thought to myself, that this would be a great time to show a small token of appreciation to my readers who have inspired me to keep going even after feeling discouraged. What better way to show it than a Thanksgiving day drawing and giveaway?! All you have to do to enter the drawing is “Like” On The Upcycle on Facebook, and comment on this post. I would love to hear what you are thankful for in life or if you have a favorite “On The Upcycle” project what is it and what do you like about it? I will draw one winner on Thanksgiving day and announce the winner on my blog. I ask that the winner contact me with their address, and I will happily mail your prize. Thanks again to all my readers and Good Luck! Now there is another new way to keep up with the “upcycle”. 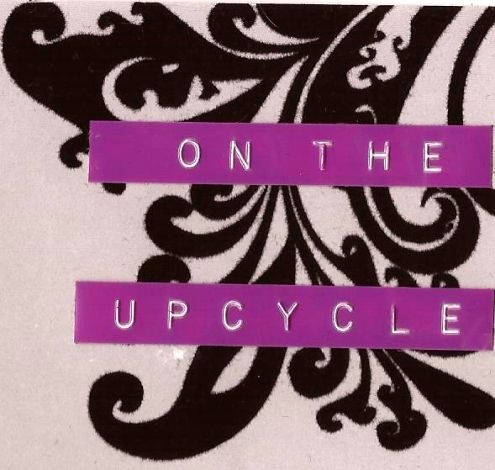 You can follow my blog “On the Upcycle” via my new Twitter account. I have never “tweeted” before so this should be interesting! I was at the fabric store today buying fabric for a chair I am currently working on, and I struck up a conversation with two very nice ladies buying fabric at the counter. I was telling them what I planned on doing with the fabric I was buying, and we started talking about Mod Podge and all the great things you can make with it. Sometimes it is easier for others to visualize what you are trying to explain, so I showed them a picture on my phone of one of my upcycled chairs. They were interested in seeing more of what I do. I scrambled for a piece of paper and managed to write my website info on the back of a n old coupon. I am interested in reaching as many creative people as I can. It is not unusual for people to come up and start talking to me. I am generally a friendly person and I guess I have a friendly face because it happens a lot! I am always happy to share ideas with like-minded people. 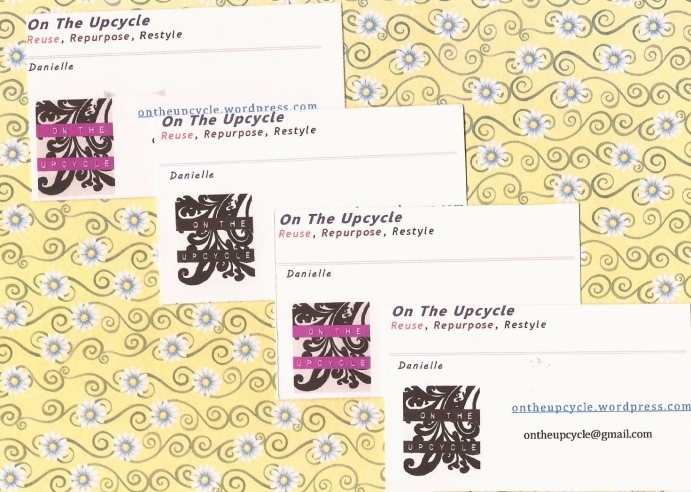 It made me think, I needed something a bit more professional to spread the word about “On The Upcycle.” I used Microsoft Word Starter Software to make these cards. I was able to download a business card template and insert the “On The Upcycle” logo and text. I printed the cards out on my printer, and the result is what you see above. What do you think? Does anyone have business cards that spread the word when it comes to your blog? Lastly, I want to shout a big “Thank you!” to all 101 of you who have chosen to follow me on my humble little blog. It means so much and inspires me to keep creating. Nothing beats the WordPress Community!